Approximately four years into the construction of the castle consent was granted by King Stephen to allow coins to be minted at Rising. There were three known types of coin minted here, (types 2-6-7) all of them silver pennies issued by the moneyer Rodbert. The fact that Rising had both borough status and permission to mint coins adds weight to the argument that it was a place of importance prior and during the time of the construction of the castle. In total 46 towns or boroughs were granted privileges to mint Stephens coins around Britain, this was one of the largest number of mints issued during the medieval period. It is believed this was one of Stephens tack-ticks, allowing extra mints as a way of gaining support on his succession to the throne. With the anarchy surrounding Stephen and widespread disapproval of his accession to the throne. Other signs of defiance can be seen in the striking of coins of Matilda along with evidence that other individual coins were struck by various Lords supporting Matilda from across the country. Also in defiance, some of Stephens coins were struck with a voided X across the bust, interestingly many of these were East-Anglian type mints indicating or suggesting that he may have been particularly unpopular in this area. However this is not the case for Rising's coins, and this may be due to the Lord of the manor William D'Albini Earl of Arundel and Chief Butler to King Henry 1 having family connections with both Stephen and Matilda during this period. 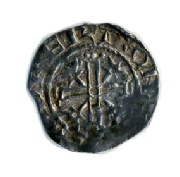 These coins were usually struck or re-struck in secure areas which may have included churches and castles. As the castle was in its infancy and was not completed during this time we are only able to speculate as to where the coins were struck in Rising, however it is believed there may have been an established market operating here at that time. To date very few individual rising coins have been recovered, leading to a high market value. However a single hoard was discovered at Wicklewood in a ditch in 1989, this spectacular hoard contained 482 silver coins in excellent condition. 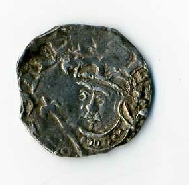 Part of this contained a large quantity Stephen coins minted in Rising, Norwich and Thetford covering a twenty-five year period representing the reigns of Henry I, Stephen and his mother, Matilda, David I of Scots and Henry II. It is suggested this hoard was possibly buried for safety but never recovered by its owner, this being a significantly large sum of money for this period. One might speculate that this hoard was buried by a member or an associate of the D'Albini family since they owned the castle at nearby New Buckenham. William and his family were also frequent visitors to Wymondham Abbey close by which they had founded in 1107. The church was added in 1130 which they held the right of visitation, including holding the title as Lord of the Manor.